The TPO & Seapost Society is the only one dedicated to collectors interested in Travelling Post Offices (TPO) both on Railways and on the High Seas (Seapost). 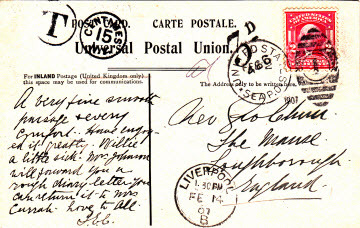 Our members collect TPO and RPO postmarks and covers, sea post and paquebot marks, ship and packet letters, and other maritime postal history. Our membership is world-wide as are the topics covered. Please enter our site by means of the navigation bar, news items or the site map and site search facility. The Society welcomes everyone interested in world-wide railway Travelling Post Office and Maritime (sea post / paquebot / naval / ship letter / river or lake steamer) philatelic material, whether as their main collection or as part of another collecting field. See our list of TPO and Seapost articles introducing these topics to new visitors. The Society issues an award winning quarterly Journal full of news and interesting information on TPO and Seapost matters. We hold Postal Auctions four times during the year. The exchange of news, views and information between members is encouraged through the Journal and by means of meetings held periodically in UK regional centres and in London. The navigation bar will guide you through our web site. To contact the Society, please go to the Contact page. To join, go to the Membership page. We have a large Reference Library and list of Publications for sale as well as a page of Research Resources. While Great Britain and countries from the British Commonwealth use the term T.P.O for a mail sorting office on the railway, other countries with TPO systems gave their operations different names. Canada and the USA use the term RPO while other countries use the terms Ambulant, Ambte, Amb., Ambu, and Ambulancia. Further terms include Bahnpost, Fahrend, Postamt, Messagieri, Postvagon, Vagon Postal, Jernbanebureau, Postekspedisjon, Jernvagens postkupéexpedition and Postkupéer. Most recently we have learned that in Sarawak Pejabat Pos Bergerak (PPB) means Mobile Post Office. All of these terms mean the same thing: they all signify a Travelling Post Office. Refer to the TPO introduction page for more explanations of terms. Compared with T P O names, seapost, ship letters and maritime mail terms are relatively easy to manage, so just watch out for Paquebot, Ligne, Sea Post, Schiffs Brief, Schiffspost, Seepost etc., not forgetting Packet as in "Falmouth Packet"
Our members are also interested in river and lakes mails where the covers bear marks such as STEAMER or VAPOR PAQUETE. Our society supports and encourages members to publish books and articles relating to our areas of interest. Our publications page lists society publications for sale. Recently recognised new mark: the old PAQUEBOT mark for ABIDJAN had broken by 1979 and the "T" had fallen off. Someone in the PO made up a temporary mark by copying the old handstamp which, of course, did not have a "T". It could be the only known example. 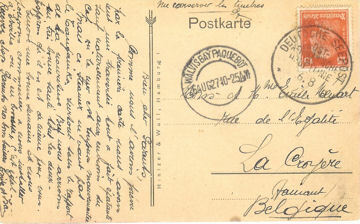 This "Shipping Postmaster Capetown" cachet was added to a postcard on route for Germany. It was posted from the Hapag Linie vessel "D.Toledo" in Capetown harbour. 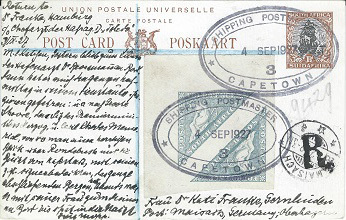 The Shipping Postmaster handstamps are unique to South Africa and were used only in Cape Town and Durban. The Shipping Postmaster boarded ships in the harbour to sell postage stamps and accept registered letters, and telegrams for onward transmission. Cover posted from the New Zealand Shipping Co. line vessel S.S RANGITATA at Port Chalmers. 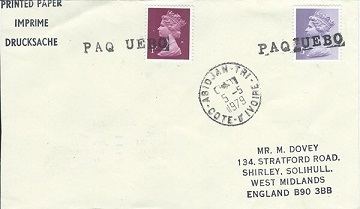 Dated 13th September 1953 it received the H1561B paquebot mark in purple (other colours are known including red, black and green). For paquebot mark numbers refer to PAQUEBOT CANCELLATIONS OF THE WORLD 4th Edition by Mike Dovey & Keith Morris. 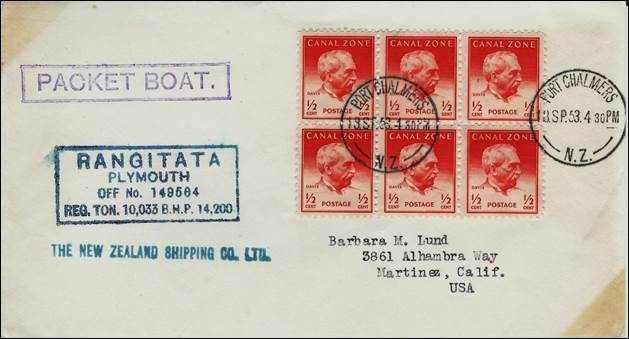 PPC mailed on board the USMS New York: 2¢ stamp cancelled in the sea post office by UNITED STATES SEA P.O. / 1 on February 2 1907 on a westbound voyage. 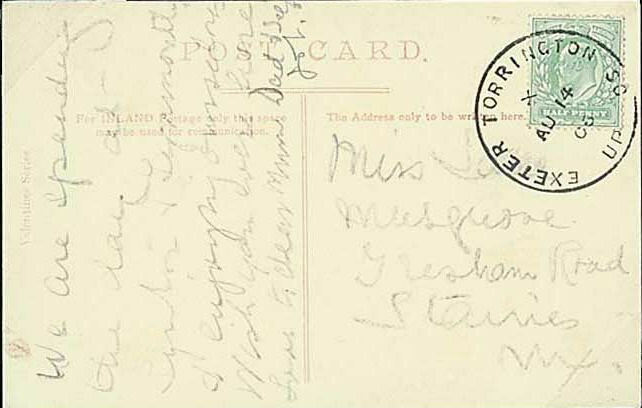 The card was taxed in New York and arrived back in Liverpool on February 14th where it was charged 3d before being sent on its way to Loughborough. 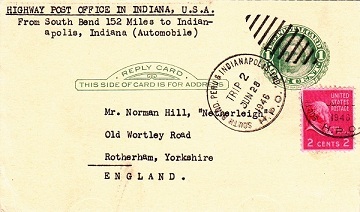 Cancel of the Highway Post Office service running between South Bend, Peru and Indianapolis, Indiana on the reply section of a US postal card, addressed to GB, June 1946. 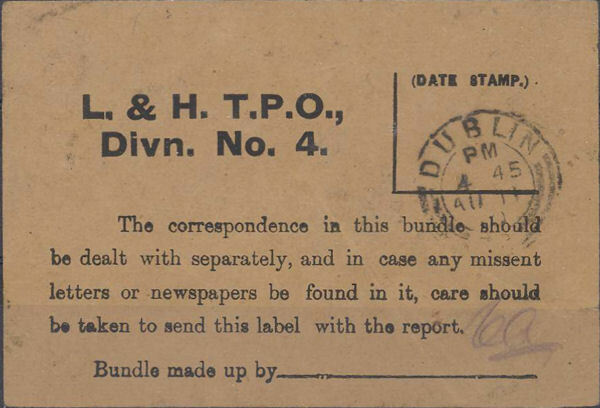 London & Holyhead TPO bundle label from Dublin, Ireland. Just the sort of ephemera to enhance your TPO display! PPC of the German vessel D.ADOLPH WOERMANN with a "Deutsche Seepost / Ost Afrikanische Hauptlinie" cancel as well as a superb and rare Walvis Bay Paquebot cancel (Hosking 2916C), a very nice combination on a clean 1927 era postcard. Walvis Bay is in South West Africa and used to be the port for Woermann Line (German) to call at in order to supply the German Area which became SW Africa in 1918.